These weekly meme’s give us all a chance to check in with any works in progress we have, both Tami and Ginny and with Ginny we get to see what books we may also be reading. Do head over to both blogs, links at the top to check out other’s participating today. So what’s on my needles today ? Starting top left we have Copper Pot Milo. I’ve not worked on this in a couple of days but hope to get to it later in the week. I’m at the body of it. Have it liked to my project page on Ravelry. Top right is the Stormy Night beanie I’m knitting for James birthday. I’ve been working on this during the day this last two days, it has been one of those projects two rows knit one row frogged kind of thing. I normally hate to read charts and always opt for the written directions. This pattern though the written directions are not so good and when I looked at the chart and what was in front of me and went with that it started to go smoothly. I’m about half way through this now and I’m hoping I made it long enough, he doesn’t normally like to fold up the ribbing so time will tell if I have made it long enough. Bottom right is the second Ocean Blue sock. Up to last night this has been my project to knit on for night time. It is now at the heel part so half way there really. This pair of socks have been surprisingly quick. Bottom left is a doily pattern I started last night. I will have more details on that in Sunday’s YOP post so do check back then. Startitis has not finished yet and no doubt there will be more by Sunday! The book I’m reading this week is The First Apostle by James Becker. I finished Friendship Bread last week and will do my review and post it on Monday. I’m really enjoying The First Apostle and it is moving along quite quickly. 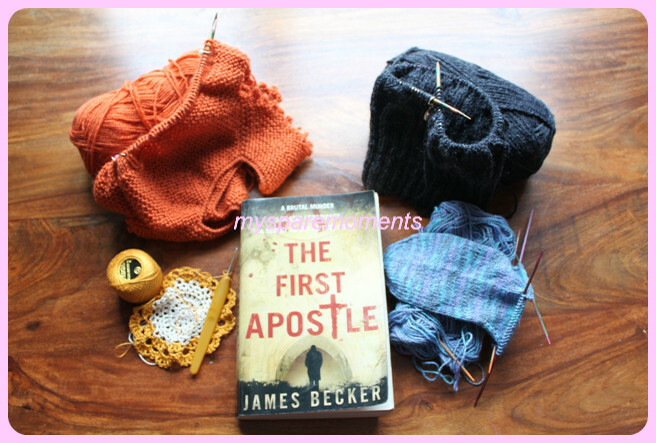 This entry was posted in Books, Crochet, Knitting, Work in progress, Yarn Along and tagged Copper Pot Milo, Ginny, James Becker, knitting, Ocean Blue, Ravelry., Reading, Stormy Night, Tami, The First Apostle, WIP. Bookmark the permalink. You have so many projects going on and each of them is beautiful! I’m thinking of casting on a pair of socks soon. 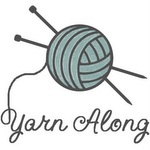 I have lots of sock yarn at the ready. Not sure if they should be for me or him 🙂 That milo reminds me of fall that cannot come soon enough. How in the world do you decide what to pick up each time! Every time I have more than one project going I feel a weird guilt as if I am being disloyal to each of the ones I don’t choose to pick up. Apparently I assign feelings to my projects, haha! I really love your doily – is it crocheted? It makes me want to learn to crochet maybe more than any other crocheted project I’ve seen before. And I still love the color of that Milo. Gorgeous! I tend to pick up whatever project I feel most like doing really. They are at the moment across my coffee table and I really must move them before Evelyn gets on her feet ! I think assigning feelings is a good way of putting it, its what makes us decide to keep working on something. I’m not so feeling the love of the beanie here and that’s mainly down to the pattern. Yes the doily is crochet. I learned or should I say knuckled down to it and did it proper in January and I’ve had my eye on something with thread and crochet for awhile. I love it already ! I to love the colour of the Milo, my daughter has such a good eye for colour ! It reminds me of Autumn. Love all your projects Ruth. When you leave a comment on my blog and I want to say thanks, you are a no reply. Can you change that? so many great projects!! !…when I see such pretty crocheting like your doily, it makes me want to give it a more serious try!!! And everyone (everyone that is except me!!!) is making or has made a milo!!! I’ve got babies to knit for (church—not mine! ); guess I need to get on it!!!! Thanks for hopping into my blog space!!!! Your very welcome for the visit. The milo is sooooo fantastic and such a quick knit you’ll love it and you have so many choices on cable and boy girl knit with it. I love that you have so many projects going on. I always have so many that when it comes time to post on my blog I don’t feel that I’ve made much progress. I am an empty nester. I don’t know how you manage with 8 children. How wonderful. Thank you 🙂 I like to change projects daily and some suit day time knitting and some which require concentration can only be worked upon when little ones are tucked up, hence I think why so many but it is nice have the choice and they do all eventually get finished. I love that rich orange you’re using for the Milo vest. It’s always nice to see color as many choose neutrals. I can’t wait to see you get to the cables on James’ hat. I thought you were whipping out a plain beanie. Cables are fun! The first time I had tried them they were way too tight. But with my cousin’s infinity, they were easy peasy. Can’t wait to b see. Yet again, so much going on, love all your projects, nice to see your Doily, I do enjoy crocheting in the round like that, especially something like that where you see it grow continuously. Book sounds good, look forward to hearing more about it. Thank you Faith, I realised I didn’t give any details on the book only the name, sorry I will correct that next week. I did the doily and then wondered did people use them anymore lol.